In the flashlight beam, the stunning devastation, the wreckage that moments before had been our kitchen was almost unfathomable. In that instant, it was a mixture of glass shards, jagged pottery pieces, food, flour, various oils and, heaven help us, balsamic vinegar all stirred into a crackly, jagged, sticky goop by the Nov. 30 earthquake. The rest of the house fared little better in the magnitude 7.0 quake. Pictures were broken. The wood stove was rendered hors de combat. Water dripped from a broken pipe in the garage, which, while always messy, looked as if it had been targeted by a drone strike. The dogs? Scared senseless. Wallboard cracks here, wallboard cracks there. Certainly not as bad as some houses, but bad enough. My wife, Linda, and I - like Alaskans across Southcentral that dark morning - kept telling each other, “At least we’re OK.” We desperately wanted it be so as the house continued to periodically shake as if built on a bowl of jelly. As the arduous cleanup got underway, it was not long before Lidia Selkregg’s name popped into mind. I had interviewed her for a news story in March 1989. The question then was whether Alaska had learned anything from the Good Friday earthquake 25 years earlier that killed perhaps 142 people, mostly by tsunamis. That monstrous, 9.2 magnitude earthquake started at 5:36 p.m. on Good Friday, March 27, 1964, 25 kilometers beneath the Prince William Sound coastline, 74 miles southeast of Anchorage. The Pacific Plate lurched north, slipping beneath the North American Plate, and the land slid, heaved and sank for 4 minutes, 38 seconds, give or take. It was the most powerful recorded earthquake in U.S. history - and the second-largest ever recorded, next to a 9.5 magnitude killer in Chile only four years earlier. With Alaska’s earthquake history - there are nearly 40,000 of them annually - Alaskans, especially Anchorage residents, should know Selkregg’s name. She and others like her likely kept the recent quake from causing more destruction in Anchorage than it did. Well, that - and luck. 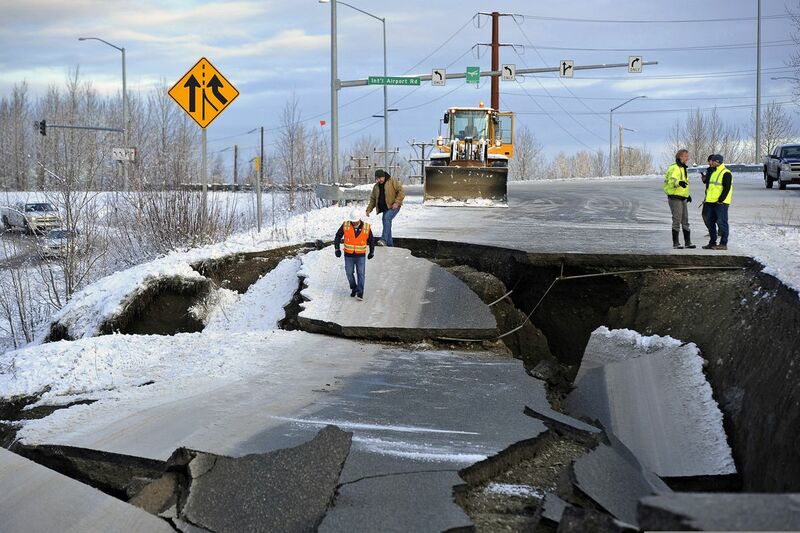 Then a geologist and former Anchorage assemblywoman, Selkregg fought long and hard before her death in 1999 to ensure Anchorage never would see a repeat of the 1964 disaster. She was, to say the least, intense when speaking about it. She excitedly waved her hands and talked at a machine-gun pace, saying she and others feared officials and developers had forgotten that day's tragic lessons. Selkregg was certain there would be a next time. It was, she said, inevitable. She was concerned reconstruction was occurring in the same earthquake-susceptible areas as before, and that would mean greater losses in the next great quake. ”I'm positive there will be one, I just don't know when," then-state seismologist John Davies said of the possibility of another mega-quake. "But I think the tendency is for us to forget the lessons." The battle pitting safety-conscious engineers, scientists and others against development-oriented landowners erupted shortly after the shaking stopped in 1964 and raged for years. Anchorage building codes immediately after the quake addressed the safety of buildings, Selkregg said, but not the ground beneath them. That meant sturdy structures were being built on land prone to slides, notably high ground sought after for its views, she said then. The safety versus development fight continues today. Do tougher building codes - adopted within a few years of the 1964 quake - and tougher land-use regulations make areas of the city most susceptible to earthquake damage safe for development? Should such construction be put on hold? It was, and is, a difficult question, as tough now as 54 years ago when the Good Friday quake killed at least eight people in Anchorage. Perhaps those who believe such development is safe have a point. There have been, after all, no reports of deaths or serious injuries in the Nov. 30 earthquake, and instances of major damage, other than roads and bridges, were minimal. But that may be luck. The 1964 earthquake was more powerful and lasted minutes, allowing time for soil to liquefy and bluff areas to collapse and slough. The Nov. 30 quake lasted only seconds in most areas. Who knows what would have happened after 4 minutes, 38 seconds of continuous shaking? The debate will rage, just as it has since Selkregg’s day. In the meantime, there are myriad reasons she and others who fought for safer development and tougher building rules deserve our thanks. That none of us was killed Nov. 30 is reason enough. Paul Jenkins is an editor of the AnchorageDailyPlanet.com, a division of Porcaro communications.